Steralize 6 quart jars if canning by washing them with soap and water and putting them in the oven at 215 degrees for a minimun of 15 minutes. They can stay in the oven until you are ready to take them out. Peel, core and slice apples. (Leave slices about 1/2 inch thick). Combine sugar, cinnamon, nutmeg, cornstarch and salt in large pot. Add water and cook on high heat, stirring frequently at first and then constantly until it boils. Let it boil for about a minute, at this point it should be nice and thick. 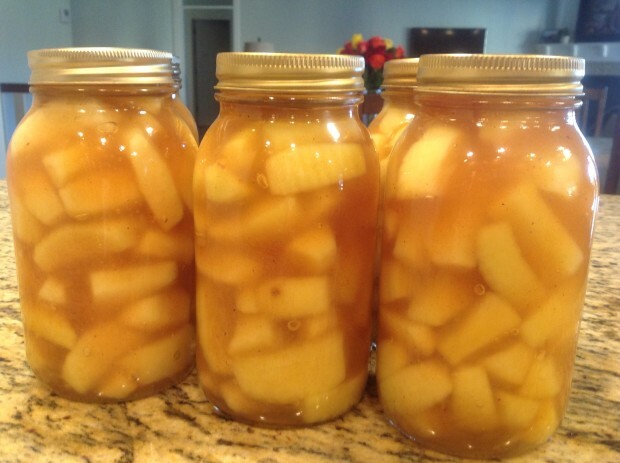 Pack apples in hot jars and fill jars with sauce just to the bottom rung of the mouth of the jar. I use a wooden spoon to push the apples down. DO NOT FILL THEM ANY HIGHER! THEY WILL EXPLODE! Yes, it happened to me! :(. Process jars in hot water bath for 20 minutes or freeze however you want to.